In this charming children's book catchy rhyming verse and arresting illustrations accurately capture the characteristics of a range of creatures young children commonly encounter in suburban gardens. Fifteen different creatures are featured and Dave Gunson's playful illustrations highlight their unique attributes. The honey bee, frog, earthworm, stick insect, garden snail, gecko, daddy long legs, spider, cicada, ladybird, praying mantis, cave weta, monarch butterfly, skink are all familiar to young children and the fascinating facts section at the back gives more detailed information about these creatures' distinctive characteristics, habits and habitat. Anne Hunter is a radiographer with a love nature and exploring the outdoors. She is currently working to establish forest on a block of land in north Canterbury. She has a special fascination with Antarctica, which she has visited twice, and has a Graduate Certificate in Antarctic Studies. 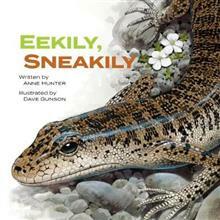 She has written a book on New Zealand birds, One Little Fantail, which Dave Gunson also illustrated. Dave Gunson is a designer and illustrator who has published more than 80 children's books, including writing and illustrating the All About New Zealand series of books published by New Holland. His work appears regularly in New Zealand Geographic magazine, he has designed and illustrated postage stamp issues for New Zealand and several other countries and as an artist has had both group and solo exhibitions over the years.